After CCA, Brian went on a culinary journey, traveling to places like the Caribbean but eventually landing back in Los Angeles. For four years, Brian worked directly with Chef Ricardo Zarate in opening his four restaurants: Picca, Mo-chica, Paiche, and Blue Tavern to national praise and accolades. Prior to meeting Zarate, Brian was Chef de Cuisine of LA Prime at the Westin Bonaventure and Executive Chef for Room Forty. He was opening Chef de Cuisine of Eva restaurant and part of the opening team of Fig and Olive in West Hollywood. 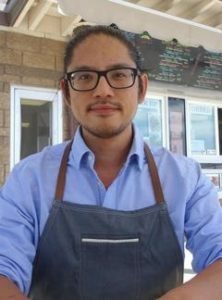 As well, he spent 3 years with the Patina group at Cafe Pinot and helped open Leatherby’s Cafe Rouge in Costa Mesa as Sous Chef. Throughout the years, Brian has been able to travel and cultivate his culinary voice by learning how to incorporate Asian, French, Latin, and Californian influences into his food. Brian competed on BRAVO’s nationally acclaimed tv hit show Top Chef season 11: New Orleans where he had a national platform each week to showcase his talent. Since Top Chef, Brian has been busy with private and corporate events, consulting projects, and cultivating his concepts. Three years ago, he opened his first concept Tackle Box- local grub shack in Orange County at Corona del Mar state beach to a lot of fanfare and accolades from the community. Recently Tackle Box was acknowledged as one of OC’s “2017 Best Restaurants of the Year” as well as “2016 Best New Restaurants” by Orange Coast Magazine. On his free time, he enjoys the simple things… eating, relaxing, playing tennis, and spending time with friends and family, and of course Penny, his basset hound.